The universal purpose of a vacation is to take time away from the work and stress of everyday life to relax and recharge. The obvious expectation is that you’ll return from vacation feeling refreshed and ready to bring a renewed energy to your daily grind, whatever it may be. Too often, though, we return home from a week of lying on the beach to discover that we don’t feel better. That, in fact, we often feel worse after what usually ends up being days of indulging too much and exercising too little. Once home, we have to recover from vacation, rather than using vacation to recover from life. Enter the fitcation. A fitcation is exactly what it sounds like—a fitness vacation. This growing trend promotes planning an active, healthy, truly rejuvenating vacation experience so that you’ll return home feeling better and stronger. A fitcation can be anything you choose: a yoga retreat, a week of surfing lessons, several long day hikes, or a series of personal training lessons. It also can be a fun mix-and-match of activities, like taking a meditation class in the morning, going on a bike ride in the afternoon, and finishing with a nice jog. Pair your activities with healthy meals and a little bit of pampering and you’ve got yourself a fitcation that will leave you feeling revitalized and energetic. With a medley of outdoor recreation, indoor fitness facilities, healthy restaurants, and day spas, Cookeville offers all the elements of a fantastic fitcation. Here’s our list of the best ways to get active—and a little healthier—on your next getaway to Cookeville. What better way to get in tune with your body and mind than by practicing yoga? Cookeville’s Synergy Mind and Body yoga studio offers an array of classes and workshops ranging from challenging hot yoga to stretching and relaxation. If practicing mindfulness sounds like your ideal fitcation activity, clear your head with a calming meditation class. You can even reserve a private one-on-one or duet yoga session with one of Synergy’s instructors to get the most out of your experience. For a more intense workout, drop in at CrossFit Mayhem, home gym of four-time Fittest Man on Earth Rich Froning. Offering scaled daily workouts with some of the most elite coaches in the world, CrossFit Mayhem offers classes for all ages and fitness levels. Be sure to check out the gym’s gift shop for a souvenir as proof that you got fitter among the fittest. Fit travelers can also book a session with Willpower Fitness by TLT Sports. Located in the historic WestSide cultural district, WP Fit offers one-on-one and group workouts that also allow downtown exploring as you jog past charming boutiques and local hotspots. 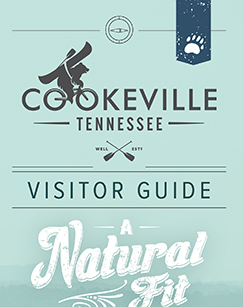 Surrounded by state parks, waterfalls, nature parks, and trails, Cookeville shines in the outdoor recreation department. If you’d like to spend a full day hiking, Window Cliffs, one of Tennessee’s newest state natural areas, will offer up the challenge. This scenic destination, adjacent to the famous Burgess Falls State Park, features a 5.4-mile round-trip hike across 9 river crossings to an overlook of natural “windows” in the limestone cliffs. Keep an eye out for another picturesque waterfall as you make the trek among steep terrain. Tip: Pack a snack and water for this one, and pace yourself for the climb out. For a short (but extremely rewarding) hike, make the trip to Lost Creek Falls. Look familiar? It should. It, along with Ozone Falls and Fall Creek Falls, were featured in Disney’s 1994 live version of The Jungle Book. Each offers breathtaking scenery and tall falls dropping to pools of inviting water. For a longer hike, head south to Virgin Falls State Natural Area. This beautiful forest offers a strenuous 9-mile round-trip hike to the falls, which is the perfect way to work up a sweat on your fitcation. Don’t miss the side trail to Martha's Pretty Point for a dramatic view of Scott's Gulf and the Caney Fork River 900 feet below. A bike ride is a great way to get moving on your fitcation, so hop on the Tennessee Central Heritage Rail Trail, which stretches about five miles between Cookeville and Algood. There’s also a three-mile bike loop at Cane Creek Park, as well as a few trails at Rock Island State Park for off-road cyclists. Isha USA, an institute for inner sciences in nearby McMinnville, offers five miles of self-guided mountain biking trails, professionally classified from beginner to intermediate skill levels, with steep climbs, water features, and tight switchbacks livening up the more challenging routes. If you prefer to get your exercise on the water, Cookeville offers plenty of scenic flatwater paddling such as Center Hill Lake, which, at 64 miles long, could keep you exploring for several days. Other great options are Stand-Up Paddleboarding in nearby Hilham at Standing Stone State Park on Kelly Lake, with 69 acres of waterway to explore or leisure kayaking Cookeville’s 35-acre City Lake Natural Area. A fitcation is the perfect reason to treat yourself to a facial or massage—after all, this trip is all about self-care. The Lavender Cottage Spa is a serene spot offering a variety of massages, skincare sessions, and even a reflexology treatment that focuses on hands and feet. Another wonderful place to get pampered is Natural Symmetry Aesthetics and Wellness, where you’ll find acupuncture, peels, scrubs, and dry brushing treatments to leave you feeling shiny and new. It’s not a fitcation without some delicious, wholesome food. For light cafe fare like sandwiches and salads, stop by Great Harvest Bread Co. or Back Room Bistro for meals made with fresh, healthy ingredients. With two downtown locations, Cookeville’s local juice bar, The TURN Around, offers everything from fresh-pressed juices and blended smoothies to seasonal salads and local honey. There you can find a tasty and nutritious meal any time of day along with rotating specials. Hiking and other outdoor trips present the perfect opportunity for a hearty, healthy picnic. On your way to the trailhead, make a pitstop at MealFit, owned by CrossFit Games Athlete Thomas Cox. Stock up on fresh fruit snacks and yummy wraps for your hike. For a more luxurious but equally wholesome menu, take a fitcation dinner date to Seven Senses Food and Cheer. World Chef Challenge Winner Chad Combs offers a dinner menu that includes grilled salmon, seared tuna, and many other deliciously healthy options to enjoy on your fitness getaway. This year, instead of spending a boozy week at the beach and another week recuperating at home, opt to turn your vacation into something fresh and revitalizing with a fitcation to Cookeville, Tennessee. From peaceful yoga sessions to thrilling hiking adventures, you’ll have no problem filling your fitcation schedule with unique outings and activities. A fitness vacation to Cookeville is sure to leave you feeling rested, energized, and ready for more.